Last week they deployed a PC version of the games on GamersGate and Steam for $3 each. Both games were featured on the Steam homepage and have been doing quite well there since their July 13th release, each spending time in the number one game slot. According to Zeboyd, they made more money in their first week on Steam than for the entire duration on XBLIG. Pretty impressive, especially when you include the sales figures from GamersGate. Clearly, releasing PC versions was a brilliant move for these guys. So why didn't their games sell this well on the Xbox 360? Because XBLIG is like the thrift store bargain bin of indie games. Xbox Live Arcade is a great platform and home to all sorts of great indie releases, like this week's Bastion. Not so with XBLIG. It has several problems. First, there is almost no quality control. Most of the games that go up on XBLIG are terrible, and they clog up the new release and bestseller lists frequently, making those lists useless as tools for finding good games. Letting indie designers release whatever they want and having the community weed out the bad games sounds good on paper, but the prevalence of trashy romance simluators, controller massage utilities, and shameless Minecraft ripoffs on the XBLIG homepage are a testament to how well it's working in practice. XBLIG also has a muddy interface that makes searching through its massive library nearly impossible. Some Xbox 360 owners might not even know it exists, given that none of its content is anywhere near the front page of Xbox Live. Even its main menu is buried under two other menus. What does this mean for a indie developer? Don't quit your day job if selling on XBLIG. Steam is starting to seem like a better platform, largely because it addresses these problems. It features indie games among all of the others in its front-page banners, lists them as a genre next to all of the others in the main game lists, and generally makes it much easier to find them than than on XBLIG. Steam also has stricter rules for what can be on it, but not so strict that oddball indies like Jamestown and the games by Zeboyd can't make the cut—just ones that keep the aforementioned garbage games away. For indie developers, perhaps the best thing about Steam is that games that sell well wind up on the homepage, indie or not. Indie games are usually cheap, which means they can sell a lot of copies and get there relatively easily. That front-page status leads to even more sales, name recognition, and long-term success. 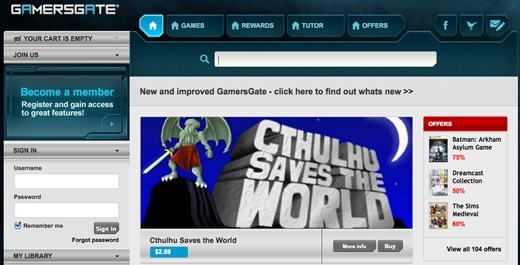 Hopefully more indie designers dissatisfied with their game's performance on XBLIG (James Ribaux of Miner Dig Deep, perhaps) will consider Steam and GamersGate (which is similar to Steam) as alternative distribution outlets and enjoy similar success to that of Breath of Death VII and Cthulhu Saves the World. I love my Xbox 360 and think that Xbox Live is the best online service available on a console system. XBLA works fine and is full of great games. But I wish XBLIG were just as good. If Microsoft cares about it remaining relevant, they should look long and hard at how Valve runs Steam's indie game distribution.